I originally created this site as a travel blog when I visited Japan in 2009. This site has since gone throuh a number of changes and it’s now more of a photography site than a travel blog. I wanted to keep the original travel entries here, however, because personally I like to read this kind of travel descriptions. During this trip to Japan, my first in seven years, I traveled from Tokyo to Kyūshū and a number of places in between, accompanied with my sister and her boyfriend. This was also when I started taking photography seriously after dabling with it a couple of years. We left Jyväskylä to Helsinki a day before our flight so that we could stay overnight at my friend’s place and get to the airport early in the morning. I had been packing frantically the whole night and spent the first leg of the trip in a coma on the backseat. 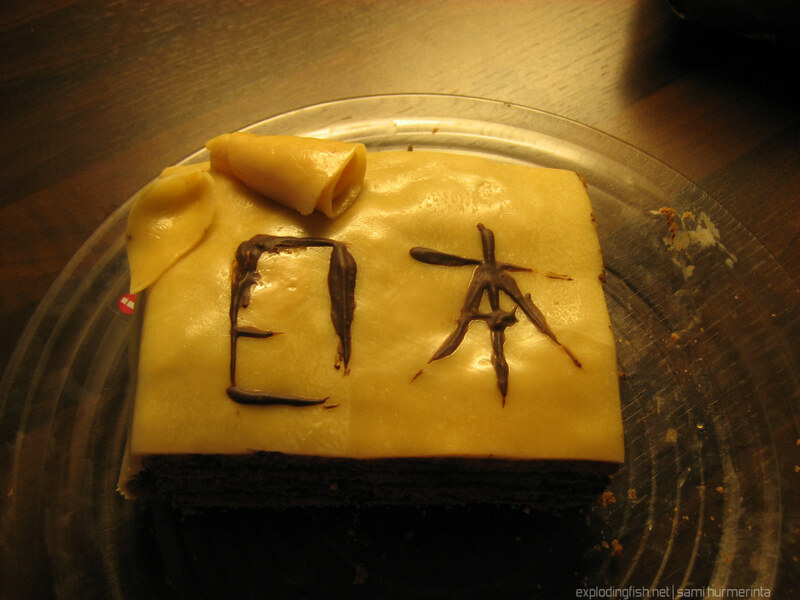 I woke up when it was time to eat our breakfast/lunch, which meant a couple of cups of coffee and a Japan-themed cake made by the others. The main ingredients of the cake were cream candies, chocolate and brandy – plenty of them. It tasted like a kiss from a chocolate-loving rummie, but it did the trick and woke me up. After arriving at my friend’s place we left our luggage there, had dinner at the local Chinese restaurant, walked around for a while and bought some breakfast. We had to be at the airport at 6:50 in the morning, so we spent the rest of the evening watching TV and went to bed early.